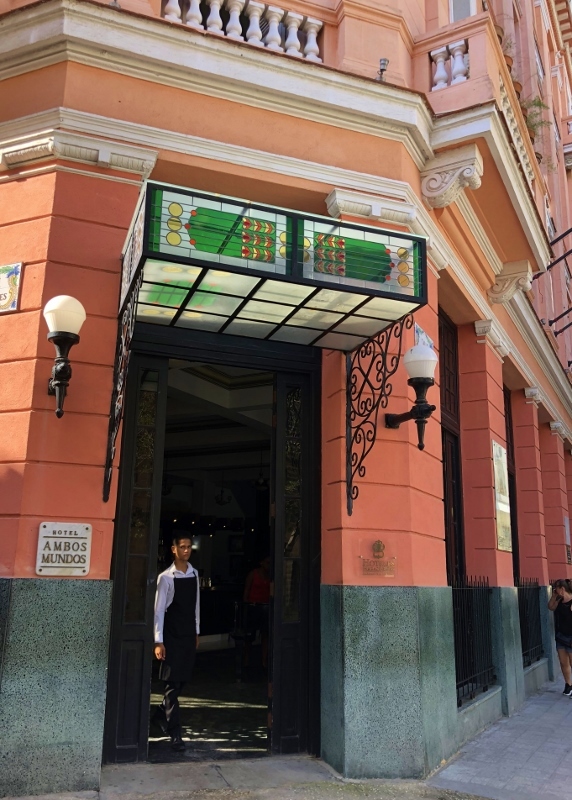 On our way to the Plaza de la Catedral from the Plaza Vieja we stopped in at the Hotel Ambos Mundos made famous by Ernest Hemingway. I was excited when our guide said that we were going in. 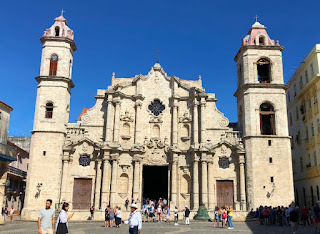 We had passed on a Hemingway tour in favor of getting a more overall picture of Havana and I was envious of some of the reports from those who had taken the Hemingway tour. The hotel was built in 1924 and Hemingway lived there for several years in the 1930s. His room was on the fifth floor from which he had views of the Havana harbor where he fished frequently on his boat, Pilar. 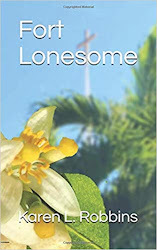 He rented the room for $1.50 a night and stayed until he moved his winter residence to a hillside just outside of Havana. He began his novel, For Whom The Bell Tolls, in room 511 which is set up as he would have had it and houses a small museum. Tours of the room/museum are available daily. The hotel still books guests and as we entered the lobby there were some at the small bar and sitting in the comfortable sofas scattered around. 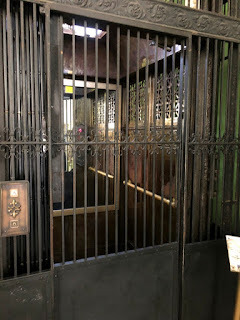 What fascinated Bob and I immediately was the old elevator. 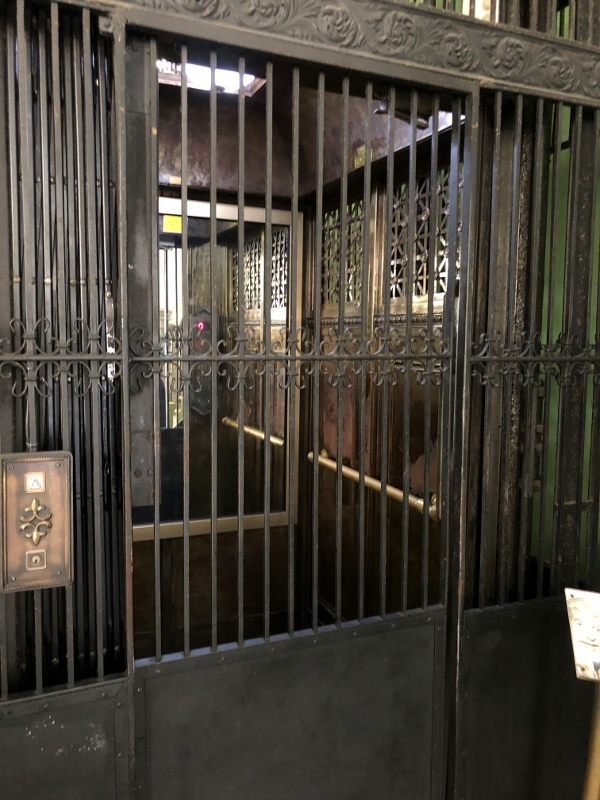 It was one you see in old movies all the time--a cage in the middle of a taller cage of bars that stretched from one floor to another. I took one picture before I realized it was actually functional. When the elevator came down, I took another. 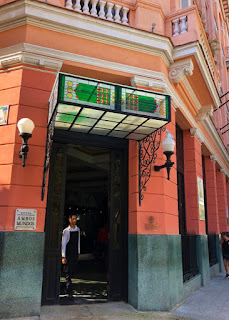 After examining the elevator, we moved to a small corner in the back of the lobby that had pictures of Hemingway and the man who was his fishing buddy, Gregorio Fuentes, who many think Santiago in the story, The Old Man And The Sea, was fashioned after. The hotel stop was a little bit of Hemingway and I enjoyed it. 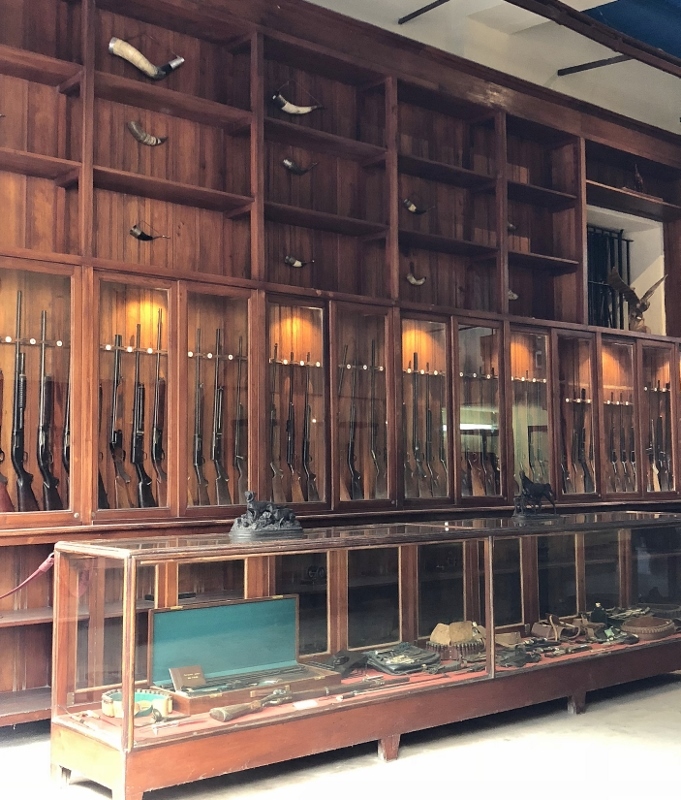 One of the other interesting things we saw on the way to the Plaza de la Catedral was a gun museum. Guns are not allowed unless you are a collector and can pass the rigorous screening. Add Cuba to the growing list of countries who have strict gun control. Along the way we also stopped for a few minutes to admire a huge mural that while it looks like a painting, it is actually an amazing mosaic made of small stones. 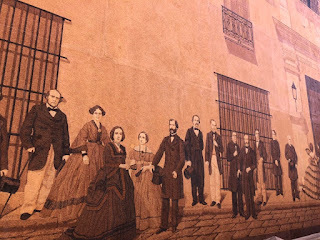 It depicts 67 figures of art and history in Cuba. The small rocks were soaked in acrylic resin to get the 13 shades of the four basic colors in the mural. It is also a mirror image of the building across from it. We wandered around a bit and went into the Cathedral to sit for a few minutes and enjoy the decor. Outside, from across the plaza, you can see that the two towers are different in size. When they were building the second tower, they realized they had to make it smaller because it was encroaching on the side street. Bells from the towers were out on the plaza in front of the cathedral as it was being renovated.